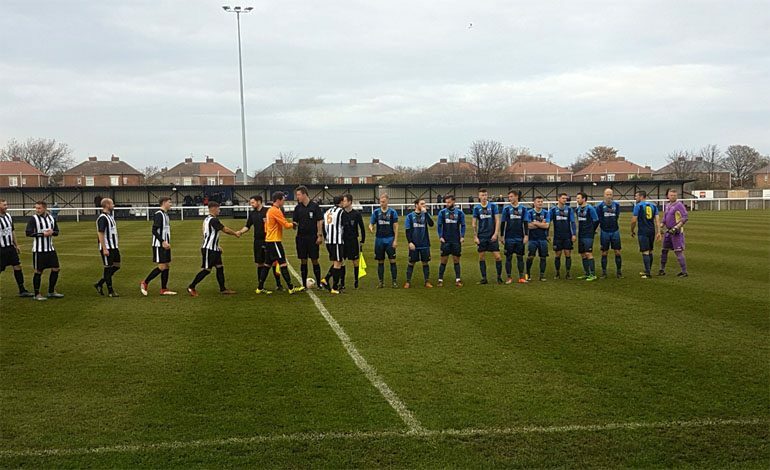 Newton Aycliffe travelled to Ashington and came away with a comfortable 3-0 victory. They started well and Ben Wood brought a good save from home keeper Grant in the second minute. A minute later a good Tom Gavin cross into the six-yard box was cleared under pressure by the Ashington defence, and on seven minutes James Rowe had a shot headed off the line. Aycliffe were rewarded on 27 minutes when a cross was laid back into the path of Ben Wood, who made no mistake. Wood was fouled 25 yards out two minutes later and Gavin hit an unstoppable free kick into the top corner of the net. Aycliffe were well on top and further increased their lead five minutes before half time. Man-of-the match Wood hit a powerful shot, which Grant could only push out to Vinny Gash who tucked it in the corner for 3-0. Aycliffe dominated the second half as well, but didn’t add to the score. Gash and Matty Pennal both put got through against Grant, but couldn’t find a way past him. Alan Harrison got away down the right at the end of the match, and he put a low cross into the six-yard box, which Pennal just failed to connect with. Aycliffe’s next game is at home to Newcastle Benfield on Saturday November 17 (3pm) at Moore Lane Park.